For brining, I make a solution of about ¼ cup of table salt per quart of water (you’ll need about 1 quart of water per pound of meat). If you use kosher salt (which I prefer…it has a “cleaner” taste), add about ½ cup per quart because kosher salt weighs less by volume. I also like to add about ½ cup sugar per quart to the solution, as that really adds to the flavor. The best way to do this is to take about a cup or two of warm water, add the salt and sugar and stir until it dissolves, throw in a handful of ice cubes to quickly cool it down and then add the rest of the cold water and stir. You want the water to be less then 40° when you add the chicken so as not to promote the growth of bacteria. You should always try and keep all food out of the “danger zone” of between 40° at 140° as much as possible, as that’s the range of temperature that’s most conducive to bacterial growth. I usually brine pork chops for about 4-5 hours and poultry for 2-3 hours depending on the size of the individual pieces (even an hour can make a huge difference in taste and texture). It is best to err on the side of too little time than too much, or the food may end up tasting too salty. After you try it a couple of times you’ll get the feel for it and be able to adjust the timing to your individual taste. 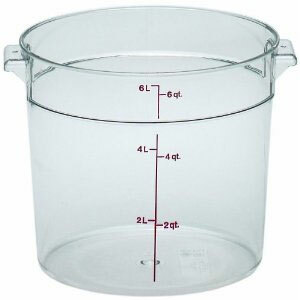 You should use a non-reactive container (I use a large plastic Bain Marie, but any plastic, ceramic or glass container will do). Make sure all the pork or poultry parts are completely submerged and place the container in the refrigerator. When it’s done brining, take the pieces out and quickly rinse them off under cold water, dry them off and they’re ready to be used in any recipe or, at this point, they can be wrapped individually and frozen for later use. When you want to use them, just defrost and they’re ready to go in any dish. One thing to keep in mind is that some pork and poultry comes pre-brined. It’s usually labeled as “Enhanced” or “Seasoned”. The producer or retailer does it not only to tenderize, moisturize, and flavor the meat but to extend the shelf life. It also adds water weight so the product, sold by weight, will be more profitable. If you do purchase this type of meat, you shouldn’t brine it…it will end up being too salty. A New Tomato Variety? The Kardashian!